Mark again with an update on how my challenge is going. For those that are unaware I am trying to finish the games I would blow through as a kid. So far so good in my books, I still can’t beat Star fox on the 3DS, so I have hooked up my 64 to see if maybe it is a controller issue. Once the 64 was hooked up my child hood self took over and I found my self itching to play another game which I was able to finish. This was the Legendary, the Legend of Zelda: Ocarina of time! 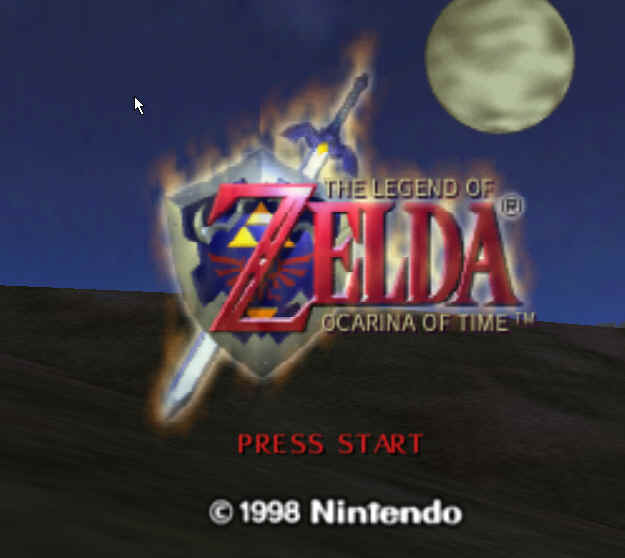 Just a warning that this is going to be a VERY opinionated post because Ocarina of Time was probably my favorite game as a kid, and arguably one of the best games of all time! The year is 1998, it is a cool brisk Monday in Toronto Ontario on November 23rd. I was on my way to school, counting down the seconds until the bell rang and I could run to my local Micro play to pick up my copy of the Legend of Zelda: Ocarina of time. I am just going on record now, if my child ever anticipates a game like I did for Ocarina of Time…I am taking him/her out of school for the day to get it! Because it was the longest day of my life! I will never for get reading Nintendo Power for the inside look at the game Moths before it came out. I had the Childhood levels all planned out before the game was even released. I knew the order of the temples i had to do, what gear I would need, and where to get upgrades. 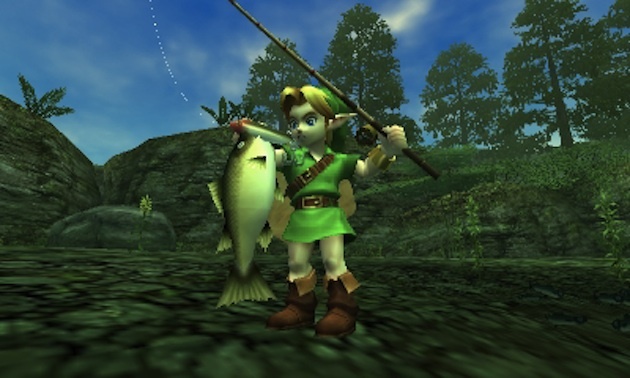 My plan was to get to Lake Hyrule as fast as possible so I could start fishing ASAP…I mean Fishing as a mini game? who has ever head of that? I loved this game so much that I even tracked down a copy Ocarina of time Masters quest…which has since been lost sadly. Masters quest was the same game but the temples were much more challenging and laid out completely different. Sort of the “lost levels” of Zelda. I even went so far as to finding exploits to explore sections of the world that were unfinished or left out last minute..Because this was released in the good old day where you could not patch a game so it HAD to work day one, and relics of ideas were still left in the game, never meant to be explored. Any way, back to the challenge at hand. The Ocarina of Time has proved to be timeless. Even though I have played this through thousands of times as a child, I still found my self puzzled during certain sections. It was as if I have never played the game before in my life! Well maybe not that bad, but it was close. I constantly got lost, or forgot how to complete a puzzle! I would have to stop and try to think back to my all nighters with a 12 pack of Coke and a bag of chips to remember how to finish the level. 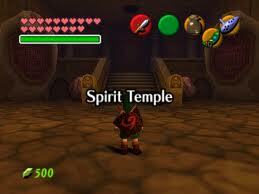 I think the level I had the most trouble on was the Spirit temple. I don’t know why I found this so Challenging in the later years, but it was. This temple had a mixture of puzzle elements to it, some involving going back in time to open passage ways for your adult self. The main element however was using the newly acquired mirror shield to bounce light into switches that looked like suns. Some times there were many mirrors to align or monsters to fight along the way. Finally the boss fight caused some frustration. 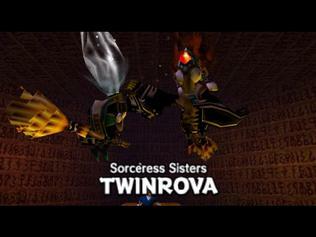 This fight consists of two twin sister witches. In theory the fight was simple, one witch was fire and the other ice. you had to use the mirro shied to reflect the fire attack to the Ice witch and Ice to Fire. I just could not seem to get this done, it should be so simple but with the old controls layout and my slower less than cat like adult reflexes I was struggling on this fight! Finally after a few choice words, some rage quites, and some mild frustration I was able to complete my childhood game. This was disheartening for me because as a Kid I was able to do the 3 heart chalenge. For those of you who are unaware of this challenge, it is simply this. Finish the game with out getting ANY heath upgrades or dieing once. This was especially challenging in the later part of the game becasue most bosses would do more damage than you had health if you got hit! But that aside, my original challenge was to finish games I loved as a child…And This one I finished! The Ocarina of time held up as well as I hoped it would. I would got so immersed I this world that it didn’t matter if the graphics showed their age, although 15 years ago they were cutting edge! So take that child me! I’m not as lame as I thought I would be at the grand old age of 29! I’m thinking next i may attempt link to the past since I am in the Zelda mood! Thanks for the trip down memory lane Mark. Words can’t express what this title means to me. I need to run through it again soon. I too did the 3 heart challenge, although not without dying. I did defeat Ganon with the Iron Boots on though. However, MANY deaths were had attempting this. The music, the sense of adventure, the graphics (at the time), this title was responsible as one of the first mind expanders of my time. I knew with this one I found my favourite thing in the world to do. I would reminisce more, but I could go on for hours and hours about OOT. Hey! Listen! Oh man so could I! OoT was definitely a high point in Gaming history. The fact that you could play for hours with out even attempting to complete a mission, just exploring, finding hearts, fishing, archery, and so many other tasks to do. And the Music! I mean do not get me started! The simple fact that as the sun rose and the little chime would play before breaking into the theme was mind blowing! I may have to make it a yearly event to play-though and beat it! This isn’t a bad idea. I play through FF7 every 2 years or so now, OoT deserves the same treatment. I love the 26th anniversary orchestral album. The dub step is new to me… Must find this now! Good Job on the post Mark! 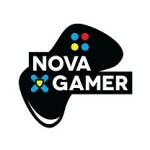 Oh god how I do miss the days of endless gaming. Even if you beat it as a kid… You cannot have a rewind event without Zelda HAHA! Although The Legend of Zelda still haunts me to this day as the game I never finished. Well that and Dragon warrior for the normal Nintendo. You never finished ocarina of time!!!!!!! What! Next time you are over I’m locking you in a room with nothing but tube tv, a n64, and a copy of oot! Mark :You never finished ocarina of time!!!!!!! What! Next time you are over I’m locking you in a room with nothing but tube tv, a n64, and a copy of oot! This is an acceptable thing to do, especially to someone who never finished OOT. As a side note, I found it interesting Mark that the Spirit Temple gave you the most trouble. During my first play through, it would have been a close three way tie between Forest, Fire and Shadow. Forest might take the cake. Oddly enough, the Water Temple gave me no issues at all, even though everyone else and their dog seemed to struggle with it greatly. Just a point… I did finish OOT if you reread I said I didn’t finish The Legend of Zelda… I.E, the first one released on normal Nintendo with the gold case. OOT was one of my favorites, Wind Walker being my least. See I like wind waker! I thought the use of cell shading made the game! The use of colour to accent mood was amazing….much like in bioshock…..review coming soon!